Peregrine falcon. Photo by Brian Caven. The peregrine falcon is a medium-sized raptor (15 –21 inches long, 40 inch wingspan) that generally preys on other birds, such as songbirds, shorebirds, ducks, and—in urban areas—starlings and pigeons. The nest scrape is usually on a high cliff ledge, but some are placed on manmade structures, including skyscrapers, towers, and bridges. The peregrine falcon declined dramatically following the widespread use of the insecticide DDT after World War II that caused eggshell thinning and widespread reproductive failure. Peregrine falcons were never very abundant. Studies in the 1930s and 1940s estimated that there were about 500 breeding pairs in the eastern United States and about 1,000 pairs in the West and Mexico. By the mid-1970s, the species had been eliminated from nearly all of the eastern U.S. and reduced by 80 to 90 percent in the western states. WDFW began monitoring the population in the late 1970s and found only 5 pairs in the state in 1980. 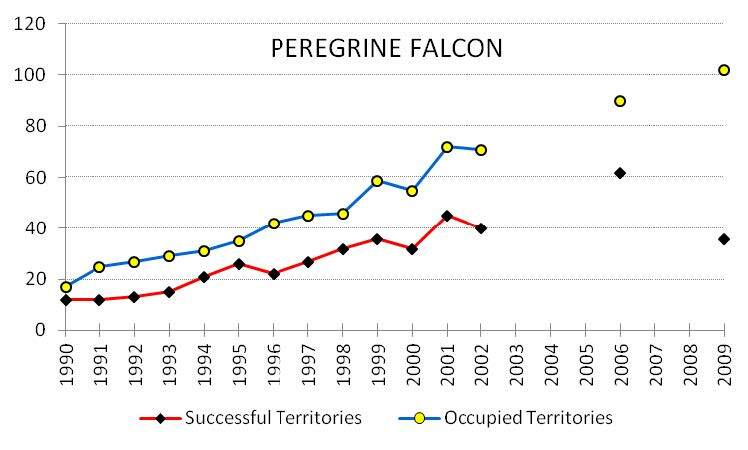 National restriction on DDT use, along with captive breeding and reintroduction programs, have allowed the peregrine population to increase in the last 30 years. In August 1999, the U.S. Fish and Wildlife Service removed the American peregrine falcon from the federal list of endangered species. The species was downlisted to state sensitive in Washington in 2002. Population numbers have been steadily increasing, with just over 100 occupied territories in 2009 (Figure 2). WDFW and cooperators continue to monitor the known sites. WDFW also interacts with landowners and agencies on disturbance and other issues that could jeopardize nest site occupancy at individual sites. Small numbers of peregrine falcon chicks have been available by special permit for falconry purposes in Washington since 2004. A lottery system was initially used for the take of falcon eyasses, but demand has decreased in the last several years. The falconry regulations were changed in 2010 and first year falcons can now be taken at areas other than nest sites, although the opportunities for this are somewhat limited in Washington. Five birds were collected in 2011. In 2012, 5 peregrines were acquired out of the 10 permits issued; two of the birds taken fell out of bridge nests and were transferred from wildlife rehabbers that were caring for them. 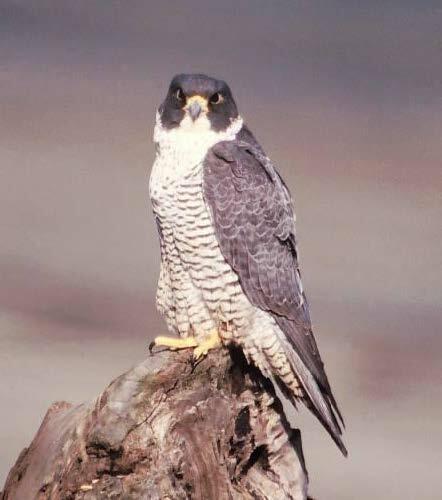 In 2011, the Washington Forest Practices Board proposed removing peregrine falcon Critical Habitat from state forest practices rules (WAC 222-16-080). This rule change was approved in February and became effective in March 2012. A new potential conservation issue for peregrine falcons arose in recent years with the detection of widely used flame retardant chemicals in peregrine eggs in Spain and Canada (Guerra et al. 2011). The chemicals, PBDEs, may have neurological or endocrine effects that, at high levels, could affect reproduction. Environmental contamination is one of the few threats that can impact such a sparsely dispersed species. Since 2000, the European Union, the U.S. Environmental Protection Agency, and many states, including Washington, have placed restrictions on the use of PBDEs and deca-BDE (Washington Department of Ecology 2011). Over time, exposure to PBDE flame retardants should decline in the U.S. as production of two of the three types of PBDEs was voluntarily discontinued in 2004 and the last type is planned for phase-out in 2013 (Washington Department of Health 2011). Exposures will continue from existing building materials, furnishings, and consumer products that contain PBDEs. PBDE use and production continue in other parts of the world, so PBDEs will still be in products imported to the U.S.
Population monitoring. Federel post-delisting monitoring surveys conducted in 2003 estimated the U.S., Canada, and Mexico population at about 3,000 breeding pairs. Post-delisting monitoring is continuing at 3-year intervals (2006, 2009, 2012; Figure 2), with the final survey scheduled for 2015 (USFWS 2003). Post-delisting monitoring was performed by WDFW regional staff during April-July 2012 at 25 locations statewide in Washington. Site examination and data records were performed and collected according to an established protocol. Washington Department of Transportation staff assisted with monitoring of 1 territory (Lewis and Clark Bridge). Reproductive performance was substantial in 2012, with territory occupancy at 84%. Productivity was 1.81 young among 21 occupied territories and 2.38 young among 16 successful territories. Partners and cooperators: U.S. Fish and Wildlife Service, Falcon Research Group, Washington Falconers’ Association, Port of Olympia, Washington Department of Natural Resources, Washington Department of Transportation. Guerra, P., K. Fernie, B. Jiminez, G. Pacepavicius, E. Reiner, E. Eljarrat, D. Barcelo, and M. Alaee. 2011. Dechlorane Plus and related compounds in peregrine falcon (Falco peregrines) eggs from Canada and Spain. Environmental Science and Technology 45:1284-1290. Hayes, G. E. and J. B. Buchanan. 2002. Washington state status report for the peregrine falcon. Washington Dept. Fish and Wildlife, Olympia, Washington. 77 pp. USFWS (U.S. Fish and Wildlife Service). 2003. Monitoring Plan for the American Peregrine Falcon, A Species Recovered Under the Endangered Species Act. U.S. Fish and Wildlife Service, Divisions of Endangered Species and Migratory Birds and State Programs, Pacific Region, Portland, OR. 53 pp. Washington Department of Ecology. 2011. What are PBDEs? http://www.ecy.wa.gov/programs/swfa/pbt/pbde.html Washington Department of Health. 2011. PBDEs (Flame Retardants). http://www.doh.wa.gov/ehp/oehas/pbde/pbde.htm .